Veteran U.S. Ski Team nordic combined coach Dave Jarrett, pictured here during the 2011-2012 season, is retiring after 15 years as a national team coach. Veteran U.S. Ski Team nordic combined coach Dave Jarrett, who led the team to heights of glory at World Championships and Olympics, is retiring after 15 years as a national team coach. Jarrett, a two-time Olympian who is now USA Nordic’s head coach of nordic combined, is leaving the tour to open a sports training center in his hometown of Heber City, UT. Jarrett was a U.S. Ski Team athlete from 1992 through 1998, competing in two Olympics and three World Championships. He retired in 1998 and spent several years coaching cross country skiing at the University of Colorado. He moved to Utah after graduation, starting the first team program at Soldier Hollow in 2000 and then began a long tenure as a national team coach. He worked on the Continental Cup tour in 2002 and was elevated to head coach in 2008. During his tenure, the team has seen its best results ever produced, including the first-ever U.S. Olympic medals in the sport of nordic combined in Vancouver in 2010. The team won an unprecedented four medals in Vancouver, including one gold and a team event silver. A year earlier at the World Championships in Liberec, Czech Republic, the USA also won four medals including two golds from Todd Lodwick and another from Billy Demong as the Americans swept every individual title. All told, Jarrett played a role in 11 Olympic and World Championship medals won between 2003 and 2013. Being on the road as a coach for a decade and a half can be grueling. Jarrett was philosophical in talking about his time spent with the team and what kept him coaching for so many years. "I really enjoyed it,” he said. “I liked seeing progress. I liked seeing the athletes come to training motivated every day." When asked if there was a single moment or memory that stood out above the others, Jarrett said: "It's easy to count the major wins. But I’m more proud of all the time in between—when athletes were rising through the ranks. All of the firsts are always good days." 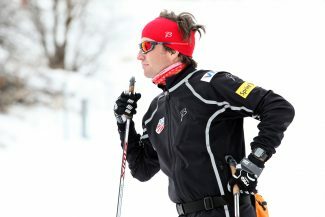 Jarrett was widely acknowledged for his role in U.S. nordic combined. "It's always gratifying to see athletes, like Dave Jarrett, give back for so many years,” said U.S. Ski and Snowboard Association Executive Vice President, Athletics Luke Bodensteiner. “DJ was able to build on the platform that was established over many years to lead U.S. nordic combined to its greatest success ever." Amidst all of his own achievements as a coach, Jarrett said that "seeing the return of former athletes, such as Bill Demong and Jed Hinkley, committed to keeping the sport of nordic combined going" was one of the things he was most proud of. "After 15 years, there are too many people to name,” said Jarrett. “But thank you to all of the athletes, all the coache, and all the supporters that have been a part of the program and enabled us to achieve what we've been able to achieve." Jarrett will be putting his extensive coaching knowledge to work moving forward, opening an Athletic Republic franchise in his hometown of Heber City. The focus will be on speed and agility for those looking to make gains and improvements in their specific sports. Jarrett was clear that the programs are designed for all athletes, all levels, all ages and all genders. The new center is expected to open in summer 2017. Jarrett lives in Heber City with his wife, Kelly, and two children, Jack and Lala. USA Nordic expects to make an announcement in the near future of its coaching alignment going into the Olympic season.